DO YOU WANT TO BE A SOCIAL MEDIA CELEB AND EARN CASH PRIZES OF Rs.20,000 DAILY? To Choose & Use ! YeDub is an amazing dub application with a unique concept blossomed by the creators of YePaisa. Here, you can Create/Share short selfie video/audio messages dubbed in the voice of the famous personalities you adore. Amongst the sweeping array of dialogues from many famous personalities belonging to different sector like Bollywood, Politics, sports etc. you can select the one and deliver it to someone special. What has made us the trailblazer in this industry is our pristine concept of customizing the messages. To elaborate, you can now record your own message and dub the same in the voice you desire. Isn’t it amazing? Now whether it’s a festival, birthday or anniversary creating custom greetings has never been so easy and not to forget the Hindi Movie Masala Tadka which just makes everything better. Let’s now see what’s in store for you. Now create custom dialogues of your choice using yedub custom dialogues feature. 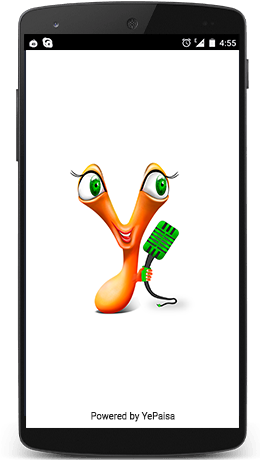 Just record your dialogue, select the celeb voice and be a Rockstar. Choose from our existing Voice database, pick your favorite celebrity voice and record the dialogue of your choice. Choose the dialogue of your choice ranging from different moods and languages. Create Selfie videos instantly and share with friends and family. Share your dubs with friends on facebook, twitter, Whatsapp and other social media using in app one touch share feature. Yedub is cool because of the freshness of its dialogue library. It’s customizable to your needs and lets you record dialogues of your choice that to in your favorite celebrity voice. You can explore our many categories of dialogues as per your mood or the latest trend. Ease simplicity and convenience is what we deliver. The overall design has been kept simple yet attractive such that even a small child can make use of this amazing app. The joy of sharing is majestic. Sharing is now just a click away. We have partnered with prominent social networking sites like Facebook, Instagram, Twitter, Google+, Youtube and WhatsApp to offer the best of sharing experience to our users. Just imagine it’s your girlfriend’s birthday, she is a die-hard fan of a particular Bollywood Actor. You plan to do something pristine on her birthday this year. Here comes yedub to make your dream come reality. Choose from any customized messages at MyStore. We even have messages for your every mood. As a note of gratitude we offer you 1 Dub coins free on sign up with yedub. You can record and dub your first ever message for free. Not just that you also get 1 DUB coin free for every referral. Once you are devouring with the Yeps, we allow the transfer of Yeps from your YePaisa wallet to yedub’s. Simply you need to play your favorite online game for free, have fun, earn Yeps and redeem them for Dub Coins whenever and wherever you want. Play, earn and redeem is the simple mantra. My STUDIO is specially designed to enable a swift recording of voice over videos. What sounded impossible earlier has been brought at your doorstep by yedubs. Yedub offers multiple Format support. Recording and sharing videos has never been so plain-sailing before. The long hours of waiting and downloading has been sidelined by yedubs, allowing you to record and share the videos briskly. Are you bored sending the same stickers, notes, post and whatsapp chats, wanna try something different and make your chatting experience Fun and entertainment. 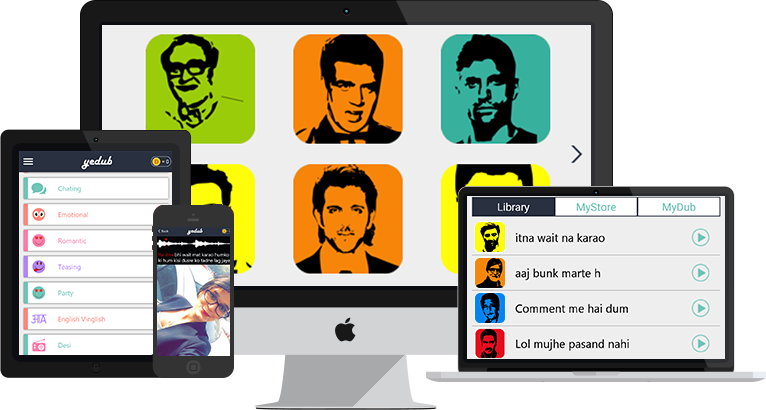 Use Yedub to give your chats your personal style signature and be a Rockstar among your friends. Use the HINT Feature in the interface to get an idea of the celebrity style and then adjust it as per your style and create the most awesome dubs ever. Use one touch SHARE to be show the same to your groups, chats, friends, family and acquaintances. Everything has a catch and limited. Earn Dub coins on Signup and for every referral you make. You can also Visit our platform YePaisa to EARN Dub Coins by playing our awesome games and embrace the concept of PLAY. EARN .REDEEM. Do you have secret talent that you still are figuring out about yourself? Do you & friends find you hilarious from time and again. Do you consider yourself a DUB ROCKSTAR Waiting to be unleashed to the world? Presenting Yedub the newest and coolest dub app in the market. Yedub is looking for talented and gifted individuals who certainly have a penchant for the art of mimicry and dubbing. The job unlike others pays you to be a STAR. Everything aside we are looking for genuine people who appreciate this art form and all they need is an audience to perform and mesmerize. Yedub is all about giving you that chance so you can be the Swagger Dude or Duded to your friends and social circle. Soon you and your talent are at a disposal of all you ever wanted. Have a look through the cool swagger of some of our Dub Rockstars, it’s their style that makes us apart from the others. Thank you for your interest in Yedub's services. Please provide the following information about your business needs to help us serve you better. This information will enable us to route your request to the appropriate person. You should receive a response within 48 hours. 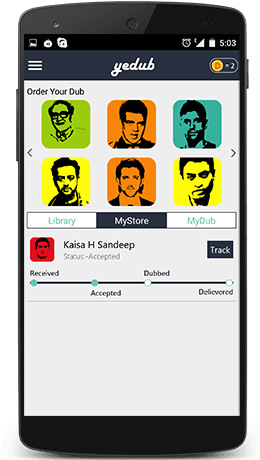 For your queries regarding dub Coins, dub quality and any other bugs please mail us on dub@yedub.com or raise a request from app. © 2015 YeDub. All rights reserved.